Kilts in South Africa are more commonly seen than you may first imagine. One reason for that is of course the military links the country has with the United Kingdom, and specifically the Scottish regiments. There are four regiments that wear kilts in South Africa, they are the Cape Town Highlanders, the Transvaal Scottish, the Pretoria Highlanders and the Kimberly Regiment. For historical reasons, a number of other units have adopted tartan as part of their parade or mess dress. This may only be worn by officers and warrant officers or their pipe band (if they have one). The senior and most active unit is the Cape Town Highlanders, a mechanized infantry unit with strong historic ties to the late Gordon Highlanders, and more recently the Royal Regiment of Scotland. They also have strong historic links to the British Royal Family, this regiment’s pipe band commonly appears at the Edinburgh Military Tattoo, and similar events overseas. Below you can see a photo of a South African infantry unit, taken during the first world war, on the British Western front. It is believed the photo was used as propaganda to boost moral during the war. 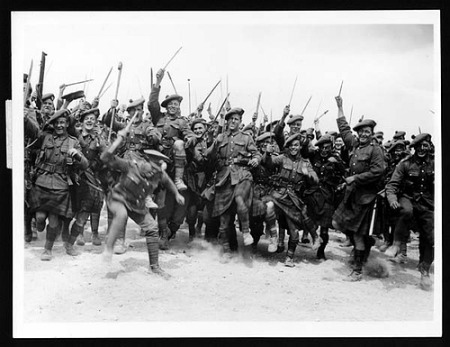 As you can see most of the soldiers are wearing kilts. Pipe bands are also very active in South Africa. There are three graded national competitions held each year and a number of smaller gatherings held around the provinces. There are no international standard Grade One pipe bands in South Africa, but at least four that could acquit themselves well in any international Grade Two competition. There are at least a dozen strong Highland Dance schools across the four major centers: Cape Town, Johannesburg, Durban and Port Elizabeth / East London and lesser centers elsewhere, this community is strong, with many internationally qualified teachers and judges in its ranks. They also hold regional and national championships. The largest on the African continent is based in Cape Town and annually hosts an event with around 360 guests sitting down to dinner. This club commonly invites members of Scottish nobility and speakers from the UK for their upmarket event. There is a second large Burns Supper Club in Johannesburg that aspires to reach the same stands set in Cape Town. Elsewhere around South Africa, there has recently been a new wave of far smaller events opening up at the end of January and into February each year as the large Scottish descendant community and those who wish they were, use this anniversary to stage their own platforms to wear the kilt, make lots of noise and consume copious amounts of haggis and whiskey. There is a very strong SA Irish Association, based in Cape Town and this does a great deal of good in raising awareness of the culture and in good works in disadvantaged communities. There are around four or five Highland Games held during the summer each year, the largest being the South Coast gathering, a little south of Durban, on the KwaZulu Natal coast. These feature the usual pipe band and dance contests and are usually well attended by the kilted fraternity. I would like to take this opportunity to thank Will Carter for his invaluable contribution, without which this page could not have been written. His company Staghorn is a very busy concern, looking after the uniform, accessories, accouterments, instrumental needs and more for pipe bands, Caledonian society members, individuals, Highland and country dance studios, traditional regiments and so on, across sub-Saharan Africa. and have a specialist facility for a unique range of African game hide dress, semi-dress and casual sporrans. So as you can see kilts in South Africa are not at all uncommon, and as with most other parts of the world the popularity of the kilt goes from strength to strength, as those with Celtic heritage continue to celebrate their Scottish or Irish roots.